APP’s Ratchet Straps are ideal for installing our ProTek Wear Pads, Pipe Shoes and CryoTek Pipe Shoes. They are used to apply pressure during installation to hold the part in place while the epoxy cures, ensuring the epoxy is distributed evenly. Our straps are specifically made for pipe and tie into themselves creating an endless loop, unlike ordinary ratchet straps. Use the ratchet assembly to tighten strap around the pipe and the support. The ratchet strap can be used during installation of the APP ProTek Wear Pads (pictured here), ProTek Pipe Shoes and CryoTek Pipe Shoes. The strap forms a continuous loop around the pipe and the support. Installation The loose end of the ratchet strap feeds through the ratchet assembly creating a loop. Pull through as much slack as possible and then tighten it around the pipe and the support using the ratchet. It should remain on the assembly until adhesive cures. 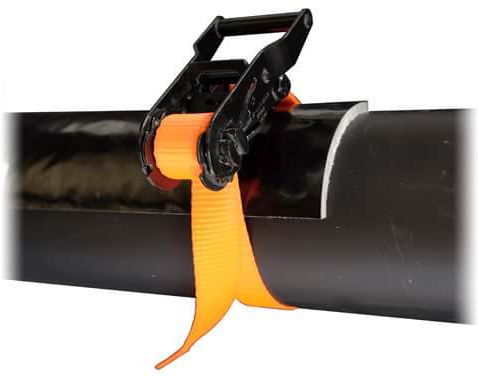 *Note: 36” length can be used for smaller pipe sizes or it can be substituted with zip ties.